► introductory part that provides an overview of the classification of the genera and a nomenclatural history of the tribe Tachyusini. ► phylogenetic part that presents results of the cladistic analysis, which was reconstructed based on morphological data, using maximum parsimony and Bayesian inference analyses. The results of the performed analyses strongly support the monophyly of the Tachyusini on the base of five unambiguous synapomorphies. In the maximum parsimony analysis, the tribe Oxypodini is resolved as sister group to the ingroup taxa. The membership of the study genera to the tribe Tachyusini and their phylogenetic relationships are briefly discussed. ► systematic part that provides the diagnosis of the tribe with key to genera, description of the genera with their synonymy and data on distribution. 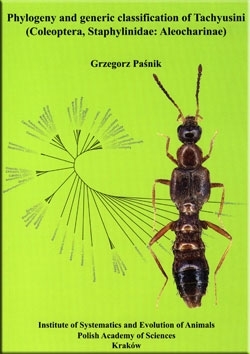 The text is supplemented throughout by colour photographs of beetles, drawings of the morphological details, the distributional maps and includes an extensive bibliography.